Come join us in our annual social mixer event!! 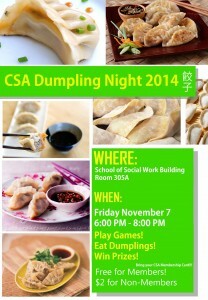 Every year, CSA hosts a Dumpling Night that is FREE for members and only $2 for non-members. This year, it will be hosted at the School of Social Work building, room 305A!It is a great chance to meet a lot of new people, play some fun activities, win prizes, and most importantly, have fun. We’ll also be serving some fresh dumplings courtesy of our sponsor, Mandarin Chef! Remember to bring your CSA Membership card if you are a member OR you can buy one at the door! We will be selling cards and shirts at the door! We hope to see you there!